Growing up, I did not fit in with the traditional chronicle of Latinx machismo I found in my neighborhood in New York City. The disguise I portrayed through dating girlfriends and neighborhood competitions with the homies on who can lose their virginity first, concealed my truth of longing to be with a man, in love, and fully live my truth as a Gay Latino individual. A night out at the Escuelitas (School) night club in Manhattan, became the backdrop towards acceptance of the greatest hidden authenticity of my life. As a college student, this nightclub provided a “space” of exploration of my identity, where I gained acceptance and tolerance from folks like me, and the freedom to just be me. In this space, I was able to freely dance with a man to reggaeton, away from the polarized environment of my undergraduate institution, and my Latinx family who, at the time could not understand why I was gay. This moment is just one of the many scenarios that members of my Queer Latinx community struggle with daily; more importantly searching for a space to be loved, live unapologetically free, and stand in their authentic truth. Today, as a Queer, college educated, person of color I carry marginalization in some university spaces, while holding the privilege of being a Ph.D. student in others. My privilege provides me with an opportunity to act as a visual to college students, staff and faculty towards these two points: that I was meant to be in this space and that my community will continue to be here after I am gone. My larger community of fellow Queer and Trans People of Color (QTPOC) instilled in me the need for advocacy to bring about change. Looking back at the Stonewall Riots in New York City, despite White queer activists being present, it was trans – Latinx and Black activists like Sylvia Rivera and Marsha P. Johnson, who lanzo (threw) the first few bricks to ignite the start of riots in 1969. The demand for space and equality for the Queer community at large produced sustainability of the modern Queer revolution we are in today, made possible by continued advocacy and promotion of equity and inclusion to ALL gender/sexual minorities, especially people of color. As a college student and professional, It is essential that I promote intentional advocacy and create spaces of support for all Queer and Trans members, especially Queer Latinx individuals of the university community. This way they too will be able to live free and continue to make the impact. Queer Latinx folks have existed. Academic activists like Gloria Anzaldua had made our influence in this mundo (world) much more significant to learn about. But what about those who may not be able have the opportunity to read Anzaldua’s work? Take pop culture for example. Figures like Wilson Cruz, Ricky Martin and trans-activist Carmen Carrera have played a role in the exposure of Queer Latinx individuals. When we think about additional figures, why not include the Puerto Rican reggaeton artist known as Bad Bunny? Deconstructing the term Queer, it is used interchangeably with the LGBTQ (Lesbian, Gay, Bisexual, Transgender and Queer) acronym, however its use is significant in defining an individual outside of the prescribed gender dichotomies of male and female, which includes gender expression, according to Britannica and the Gay and Lesbian Alliance Against Defamation (GLADD) glossary of terms. Lastly, the Queer Latinx experience is a real thing. Kimberle Crenshaw’s conceptual model of intersectionality discusses adapting the need of a multi-facet focus of an individual and their identities, rather than a single axis view of an individual. Understanding oppression among marginalized communities and its connection systematically, helps us to appreciate and support continued advancement in university and academia through research and capturing lived experiences. An individual and their identity as a first-generation, Gay, Latinx, inner-city, American citizen is extremely different than a gender-non-conforming, undocumented, Latinx individual from the south. However the connection is a common struggle through established systems of government, education and public opinion where White Anglos historically have been first at opportunity. Today, Queer Latinx folks continue to disrupt systems of oppression and rise up to defy the narrative of being a second-class individual in America’s backyard. As educators, our duty must be to continue to utilize our resources to create spaces for marginalized communities, be intentional with conversations toward marginalized populations, and advocate to find solutions that are revolutionary and passionate towards equity and inclusion toward Queer Latinx folks. In the end, “nuestra communidad Latinx” (Our Latinx Community) depends on it. 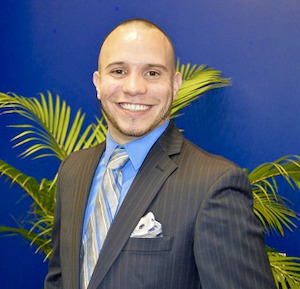 Gary Santos Mendoza is a doctoral student in Educational Leadership and Research Methodology at Florida Atlantic University.